How can solutions of Captisol be filtered? Captisol solutions are compatible with a wide-range of filtration media. For aseptic or sterile filtration in the lab, during processing or manufacturing, or in-line for administration, either 0.22 micron polyethersulfone (PES) or polyvinylidene fluoride (PVDF) membrane filters are suitable. As Captisol concentration increases, so too does viscosity and this can make manually filtering solutions above 40% w/v difficult. Heating Captisol solutions to 40°C or even 60°C substantially reduces viscosity and makes filtration much easier. What are the solid-state characteristics of Captisol®? What are the properties of Captisol® solutions? At what concentration is Captisol® isotonic? 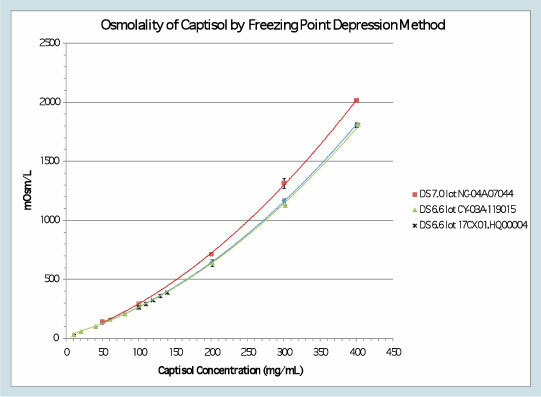 The plot below shows the solution osmolality as a function of Captisol® concentration and degree of substitution (DS). In general, aqueous Captisol® solutions in the range of 9.5 to 11.4% w/v are iso osmotic with blood and extracellular fluid (280-330 mOsM). NOTE: Preclinical safety studies have been conducted at 30-40% w/v Captisol® without any adverse effects from the hypertonicity of the solution. I would like to use a 30% w/v solution of Captisol® in my formulation. Will it be highly viscous? The viscosity of Captisol® solutions does increase with an increase in concentration. However, for most practical applications, the viscosity is not an issue. 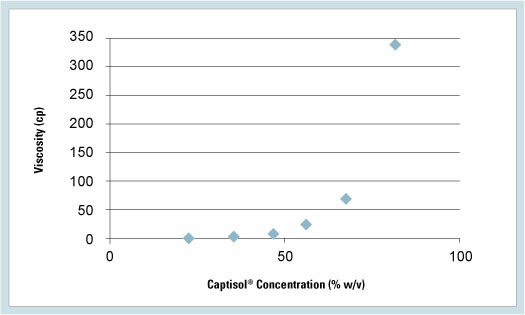 The viscosity of various Captisol® solutions is shown below in w/v units. Yes. Captisol® is stable at autoclave temperatures and under a broad range of pH and other stress conditions. Captisol® is noted to be hygroscopic - how should we handle the solid material? Captisol® is a hygroscopic amorphous solid. Its moisture isotherm is shown in the figure below. 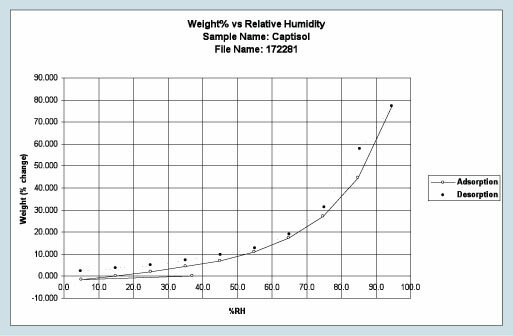 Captisol® will reversibly take up moisture without any effect on the appearance of the material at humidities up to 60% RH. Equilibration at relative humidity values above 60% will result in deliquescence. Once in this state, the 3 material can be dried, but will give a glass-like product. This water absorption behavior is typical of amorphous hygroscopic materials. Captisol® should be stored in a closed container to maintain its water content. The water content of Captisol® should be determined if material has been opened for an extended period of time. What is the substitution pattern of Captisol®? Captisol® is a mixture of both positional and regioisomers. There are three positions on each glucose unit available for modification, and seven glucose units in the parent β-cyclodextrin. Captisol® is a homogenous mixture of derivatives containing 1 through 10 substituents on each β-cyclodextrin molecule with the average being seven. The manufacturing process produces material with a well-controlled substituent distribution. This distribution is well characterized, reproducible, and monitored by capillary electrophoresis (CE). 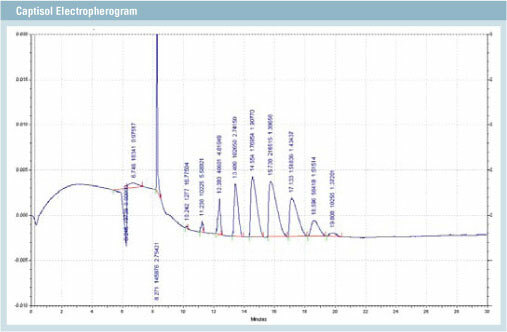 A release specification has been developed for the CE "fingerprint" of Captisol®.